Merfolk has always been my workhorse Modern deck, but I haven’t written about it in months. The metagame has shifted to a place I don’t like with Merfolk, and so I’ve been playing other decks; as such, I had nothing much to say. However, I’m finding the deck’s potential new includes from Dominaria promising enough to get back in the water. This article describes the metagame developments that have turned me off Merfolk, as well as the new cards and how they impact the deck. I’ve found that while the new cards are certainly potent, there’s not much need for them in the current metagame. Humans is on top of the metagame right now. This causes trouble for Merfolk, Firstly, Humans and Merfolk occupy a similar strategic space, but Humans has many advantages in the current metagame. Between its lower curve and mana acceleration, Humans can explode onto the battlefield with very large creatures, which is important since Lightning Bolt decks, particularly Jund, are back in vogue. Merfolk can do that too, but more slowly. The speed at which Humans dumps its hand also helps it dodges Modern’s ubiquitous hand disruption spells. A more pressing problem flows from the first. Because Humans is relatively prevalent, decks are being tuned to fight back. That preparation results in splash damage for Merfolk, most damning of all an increase in sweepers. 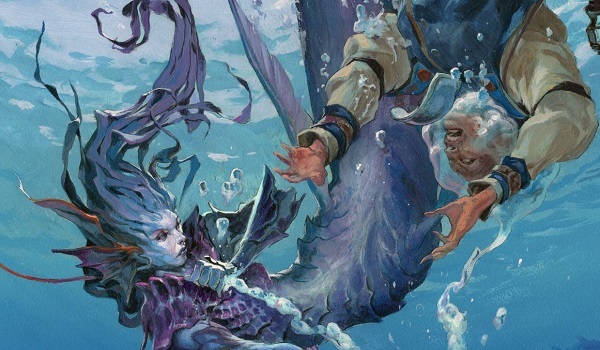 Merfolk can deal with lots of one-for-one removal; the deck is mostly creatures and has cantrips, so opposing decks tend to run out of answers before we run out of threats. Kira, Great Glass-Spinner also invalidates one-drop removal. Sweepers are far harder to deal with, especially in numbers. I’m seeing UW Control, which was never a great matchup, running Terminus, Supreme Verdict, and Wrath of God. Tron has always had Oblivion Stone and Ugin, the Spirit Dragon, but now I’m also seeing Pyroclasm, Anger of the Gods, and Kozilek’s Return. One sweeper can be recovered from; two is often lethal. Between Matt Nass winning GP Hartford with Ironworks combo, Grishoalbrand showing up in Toronto, and Storm’s tendency to simply hang around, true combo is increasingly present in Modern. This development hurts Merfolk, whose primary strategy is to race. In the past, this was fine, because Merfolk’s goldfish speed sat at a reliable turn four, while combo decks were very inconsistent. This is no longer the case, and more often, turn four isn’t good enough. With the addition of Baral, Chief of Compliance and Gifts Ungiven to Storm and Scrap Trawler to Ironworks, combo finally has the pieces to reliably kill fast instead of fizzle. This is why Humans is doing so well. Again, Humans is a linear tribal deck like Merfolk, but it features intrinsic disruption in Kitesail Freebooter, Meddling Mage, and Thalia, Guardian of Thraben alongside the fast, growing clocks of Champion of the Parish and Thalia’s Lieutenant. Subsequently, it doesn’t usually lose game one to combo. Merfolk only has Cursecatcher in those matchups, and so can be easily raced, helping push Merfolk out of the metagame. The most exciting Dominaria card is Merfolk Trickster. The Last time Merfolk got a blue candidate was Harbinger of the Tides back in Origins. After the greenfolk didn’t work out, it’s nice to see fish returning to where they belong. Of course, new additions have their work cut out for them. While Merfolk will always welcome a new lord, other creatures need to really shine to be considered. The potential speed boost was enough for Kumena’s Speaker, but Merfolk Branchwalker didn’t do enough to earn a permanent place. Trickster is appropriately priced at two mana, and boasts a disruptive and potentially relevant ability. These are huge points in its favor, but the fact that it is clearly intended as a tempo card rather than a value one gives it stiff competition. Trickster is therefore fated to be compared to the other two-drop tempo Merfolk, Harbinger of the Tides. I’ve never been a fan of Harbinger, but it caught on anyway. 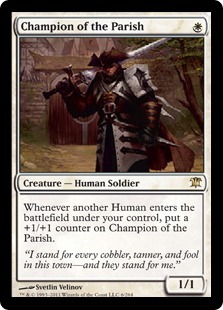 I don’t like how tough it is to use Harbinger offensively because it can only bounce tapped creatures. Harbinger has always been at its best in racing situations. Being able to knock out an attacker, even for a single turn, can mean the difference between victory and defeat, especially if the creature is hard to replay like Gurmag Angler or has been boosted like Champion of the Parish. Trickster can be used similarly to swing races, but its greatest ability is clearing out defenders. Tapping creatures may not be as powerful as removing them from play, but in a tempo deck, it can be functionally identical. The additional text after the tap ability is irrelevant in most creature matchups; critically, the creature will not attack or block for a whole turn, allowing Merfolk to swing through for the win. The final consideration is flash. Trickster has flash all the time, while Harbinger requires additional mana to deploy at instant speed. This is obviously better in terms of using Trickster as an, erm, trick, but it also has other applications. It’s often been argued that Harbinger’s flash made it better than I thought just because it could be flashed in against control. I disagree with that argument, as four mana is often far too steep a rate for a 2/2. At two mana, Trickster is far more reasonable in this role. However, Merfolk Trickster has much wider implications. While the second line of ability text is often irrelevant against fair decks, it is incredibly important against unfair ones. Trickster removes all abilities from the targeted creature. That includes evergreen abilities like prowess and flying, power and toughness setting ones like Master of Etherium‘s (killing it), and special abilities like those of Goblin Electromancer and Scrap Trawler. Trickster can be an anti-combo creature rather than just a tempo play. In my opinion, this gives Trickster a literal fin up on Harbinger. Eliminating the critical enabler creature often cripples Storm or Ironworks. Storm doesn’t strictly need a cost reducer to go off, however enabled kills come far easier. The same is true for Ironworks, but even more so: it is technically possible to win simply by chaining eggs with Krark-Clan Ironworks, but the deck is far more likely to fizzle without Trawler. So, I believe that Trickster is better than Harbinger in a vacuum. However, Modern is not a vacuum, and right now Humans is the best deck. Thus, Harbinger gets the nod over Trickster until things change. The other card that has been getting attention for Merfolk is Wizard’s Retort. I was a bit incredulous, but testing has shown it to be more plausible than expected. Surprisingly, all the Modern-playable blue non-lord Merfolk are Wizards, so it’s easier than I thought to have Retort be Counterspell, which was a Merfolk staple back in the day. Hard counters are usually very strong, especially against combo, so it makes sense that Modern Merfolk would want Retort. While I found Retort to be reasonable in Merfolk, it never blew me away. 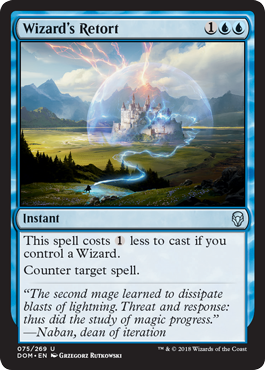 It wasn’t very hard to have a wizard in play by turn 4-5 when we’d want to keep mana up for counters, but Counterspell itself wasn’t always relevant. Having a cheap, hard counter is very good against Tron, Ironworks, and Storm, but Affinity, Humans, and Hollow One will have done whatever they’re going to do by then, while counters aren’t very special against Jund or Jeskai. If the meta swings more toward combo, then Retort is definitely strong, but being weak against the most popular deck is a huge strike against the card. Also worth mentioning: Retort gets awkward around Mutavault, which counts as a Wizard but doesn’t tap for blue. One thing to consider is whether Retort can replace sideboard cards, as specialized counterspells are a staple of Merfolk sideboards. I’m not sold on that plan’s practicality. Leaning too heavily on the four Retorts renders them overstretched and ineffective. Also, sometimes, we want more than one type of counterspell in a matchup. Another issue is impact: counters are necessary sideboard cards, but they’re rarely high impact ones. How often do we actually want a counterspell? If the answer is “often,” the sideboard must be focused on an anti-aggro package. I’m not ready to make that dive, and will be sticking with maindeck Path to Exile and Echoing Truth for the moment. While I don’t think the new additions will automatically bring Merfolk back from obscurity, they could be enough to return Fish to my toolbox. Trickster is far easier to effectively wield than Harbinger, and more generally useful; on the other side of the coin, Retort is terrific in the right metagame. As far as these new cards are concerned, though, everything depends on whether those correct metagames emerge. Trickster has been fabulous for me overall (I 5-0’d 3 times on the week it was released), so I highly recommend graduating up to the playset on it. I’ve had the most success taking a page from Humans’ book and just jamming all the disruptive creatures we have available. I’m not sold on Wizard’s Retort. Often, the non-Lord Merfolk are the most expendable, which means I’m happy to trade with them or use them to bait 1-for-1 removal. Retort is a disincentive to that strategy, because if you lose them all it becomes Cancel, which we all know is unplayable. I (and others) have been playing Deprive over all other counterspells of late, and that’s been doing well. 2 path to exile, 3 dismember, 1 doomfall, 2 drown in sorrow and 1 Black sun’s zenith. My general strategy is to target the “landwalk” lords with path’s and dismembers (and sometimes the doomfall which is really used against other decktypes), and later clearing the field with the sweepers. When merfolk stops this, it’s usually because it has cursecatcher to delay the sweep with one, sometimes two turns. In the past I’ve played merfolk in legacy with 2 judge’s familiar to ensure this delay.